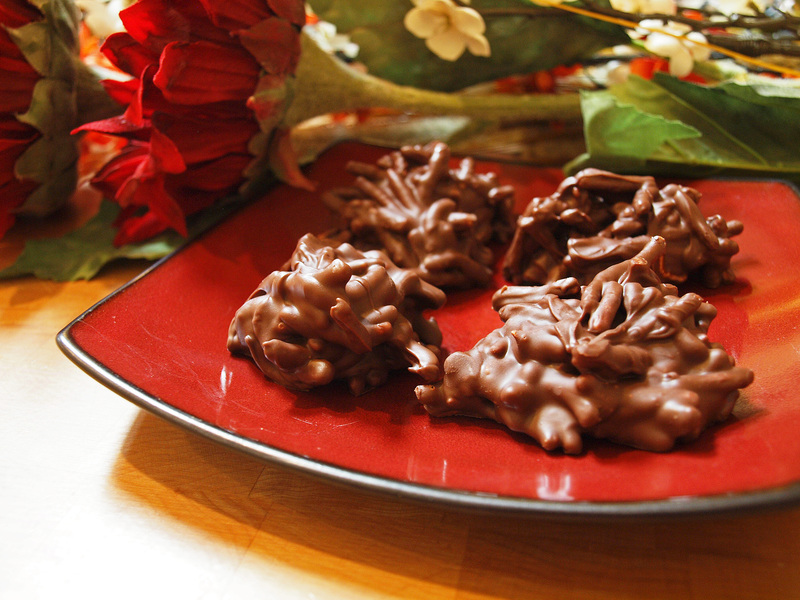 This recipe is from way back in my Girl Scout days – Crunchy Spider Legs. I ran across a “recipe” for crunchy spider surprise in World of Warcraft (Alliance represent!) and laughed because I already know how to make crunchy spider legs. Well, now you can too! These are crunchy, sweet, a little salty, and strange but addictive. For Easter you can call them Bird Nests and put a few peanut butter M&M’s on top to look like eggs sitting in a nest. These would also be fun for a Halloween themed party, or a bug themed kids party. These have happy memories for me. I remember having these at a slumber party when I was probably about nine, and we stayed up for hours playing a game in which these were the reward (carpet lava and all that stuff kids do). In college I took an English class that required us to do a presentation that involved demonstrating something, so I did a demo of this recipe in class. I didn’t have a way to melt the chocolate in the classroom, but I brought a batch of finished ones with me and handed them out to everyone. That was a hit! This is when I learned the very important lesson that if you want someone to pay attention, bring food. This is a great one for kids who are learning to cook as long as they have stove supervision. It’s also good for learning patience, as it takes a couple of hours for them to set. Making these got me off on a mental tangent of wondering how many others of the game recipes I could make in real life. If you want them to be a little more “spidery” you could include mini marshmallows to be gooey spider bodies. Mix them in at the very end, after the noodles, so they don’t melt. Spread a large sheet of wax paper on several cookie sheets or over a counter. Pour chocolate chips into a large saucepan and heat on low until they are almost melted, stirring often. Keep an eye on this so it doesn't burn! Pour in all of the chow-mein noodles and gently stir / fold in until the noodles are completely covered in chocolate. Do not break the noodles if you can help it. Spoon out the mix with a tablespoon and set the spoonfuls on the wax paper about 2 inches apart. If you're doing Bird Nests, put the M&M's on top right away before they cool. Refrigerate for 1 hour or let set on the counter for a few hours until chocolate sets. This entry was posted in Desserts and tagged beginner-friendly, chocolate, dessert, nuts.